Brands across the country have been preparing and executing campaigns to celebrate Canada’s 150’s birthday. One of Canada’s most iconic brands is ready to share with you their birthday celebrations RRRolling. 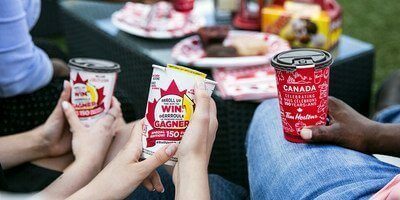 Tim Hortons is inviting guests from coast-to-coast will pick up their morning coffee today to discover the return of RRRoll Up the Rim to Win. The special edition of Canada’s Favourite Contest is back for the second time in one year. The Canada 150th special edition of RRRoll Up the Rim to Win will run at Tim Hortons restaurants across Canada from June 28, 2017 until July 21, 2017, or until cup supplies last. All prizes must be claimed by July 31, 2017. Contest rules, odds of winning and prizing information can be found at participating Tim Hortons Restaurants or at www.rolluptherimtowin.com.